Spiral stairway has a 60" diameter and features a 5 line rail system. The spiral staircase treads are 30 degree, # 122 (3/16") thick pan type steel which allows custom tile inlay. Spiral stair handrail is # 200 (1 1/2") round stainless steel tubing. The intermediate rails are # 369 (3/4") round steel tubing. The line rail posts are 1/2" x 2" flat bar located at every quarter turn starting at the bottom spiral stair step. The center column is a 3 1/2" ID round steel schedule 40 pipe. The stainless steel top handrail and top cap have a # 4 brush finish. The balance of the stair components are finished with red oxide primer. The tile inlay and final paint were done by others at the job site. Stairways, Inc. can produce spiral stairs that can meet Industrial codes, Commercial codes, and Residential codes. 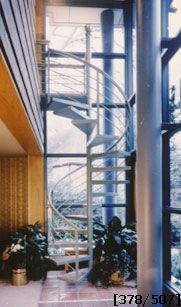 The spiral stair rail pictured will not meet current Residential codes due to the space between the intermediate rails. Even though Stairways, Inc. can produce a spiral stair in any configuration out of many materials, it is the responsibility of the buyer to inform us of local code requirements. Contact our sales staff for more information and short cuts to this process.